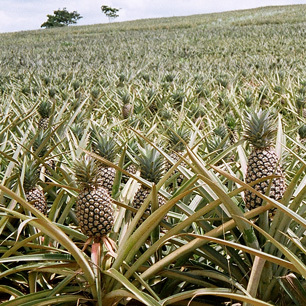 Nearly all pineapple crops in the U.S. are treated with ametryn. Ametryn is an herbicide used to control broad-leaf and grassy weeds on corn, popcorn, pineapple and sugarcane crops. It was first registered for use in the early 1960s on sugarcane fields, but is now mostly used on corn fields. But while corn is the primary use, only about 1% of cornfields in the U.S. use the chemical, and nearly all pineapple crops are treated with it. According to the EPA, the risk of ground or surface water contamination is low, and most risks of human exposure is through handling the herbicide in work environments. Ametryn is moderately irritating to the eyes, skin and respiratory system, and slightly toxic, with acute exposure to large amounts causing symptoms of nausea, vomiting, diarrhea, weakness, and increased salivation. In animal studies of long term exposure, ametryn was shown to have effects on the liver and caused decreases in weight gain. Carcinogenic effects were seen in animals exposed to excessive amounts. The results of an Australian study show that a combined treatment involving membrane filtration, activated carbon and ultraviolet disinfection can reduce levels of ametryn to below detection levels.